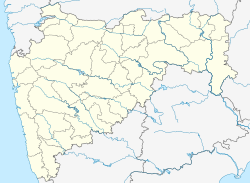 Neral is a town in Raigad district in the Indian state of Maharashtra. It is 83 km from Mumbai-South and 42 km from Panvel in the Karjat tehsil. It is a rapidly developing city of a Raigad district which is well connected to Panvel, Mumbai, Thane and Pune. Neral along with Karjat is also known as Eastern Mumbai District. Neral is located at 19°02′N 73°19′E﻿ / ﻿19.03°N 73.32°E﻿ / 19.03; 73.32. It has an average elevation of 40 metres (131feet). Neral is a place which is the center between Mumbai and Pune, Neral has State Highway which is connecting to Karjat, NH4, Panvel and Badlapur, people who visits Neral from Mumbai-South takes via. Panvel route which is more better, faster and easy to drive. It is best known as a railroad junction, with trains arriving from Mumbai and from Pune to the nearby and very popular hill station of Matheran. A narrow-gauge rail line, 21 km long, ("toy train") runs from Neral to Matheran. Nearest major towns are Badlapur and Karjat. Matheran is the unique place which is just 6 kilometres from Neral Railway Station, Neral is a town in Karjat tehsil Maharashtra. As Neral is a part of Mumbai Metropolitan Area. The town is gaining so much attraction because of its unique Hill Station and the Real Estate Development in Neral and around. The famous Matheran - Neral Toy Train departs from Neral Station. This train goes from Neral to Mathran. ^ 2011 Census Village code = 909444, "Reports of National Panchayat Directory: List of Census Villages mapped for: Neral Gram Panchayat, Karjat, Raigad, Maharashtra". Ministry of Panchayati Raj, Government of India. Archived from the original on 14 July 2014. ^ "Property rates in Eastern Mumbai District expected to double by 2017 - Times of India". The Times of India. Retrieved 21 March 2017. Wikimedia Commons has media related to Neral, India. This Raigad district, Maharashtra, India location article is a stub. You can help Wikipedia by expanding it. This page was last edited on 6 November 2018, at 15:12 (UTC).